A few weeks ago when I was home I made my daily trip to my local Target. Now anyone who knows me, will tell you I'm a Target shopper fanatic. I'm pretty much a regular there, especially when I'm home from school on my breaks. Well one of my favorite things to do in Target is to stroll the end caps of all the aisles (there's usually clearance on the endcaps!) and browse any aisles I think would interest me (which usually end up being all of them.) Thanks to Target, I get a little mini workout whenever I go there. This time around when I was visiting Target.. I found these lovely decorations on sale for $4.99. I couldn't pass these babies up. I knew they would look lovely on the walls in my dorm room and I just had to get them. Also for less than $5, who could complain?! 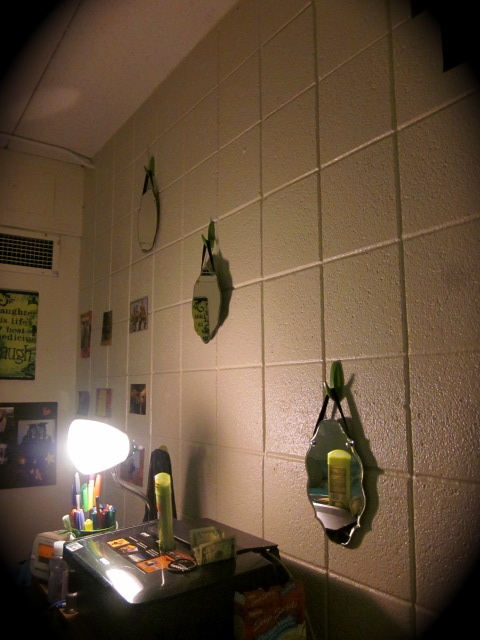 Right when I got back up to school I pulled out my trusty Command Hooks and put my beautiful mirrors up on the wall. They're such a cute decoration that add sophistication (yes, sophistication) to any dorm room! And if you have a roommate and you tend to fight over the mirror in the morning, guess what! You just got three new mirrors so there's ton of mirror space for everyone! Now I was lucky enough to find these at my Target marked down for such an inexpensive price. However many Targets tend to have different items on clearance and all the clearance prices vary by store. But if you can't find these mirrors at Target. Don't be sad, Be glad! Because these cute and simple decorations are super simple and I'm sure you would be able to make them yourself! Just follow the steps below! This can be done with either picture frames with awesome pictures of you and your family and friends or with mirrors. Just find any cute small mirrors/picture frames at an arts and crafts store. I'm sure even Target and Walmart have them. 2. Then grab some cute ribbon. Cut a strand of ribbon and hot glue the ends of the ribbon to the back of picture frame/mirror. The ribbon should look like this: ^. So you could easily hang it up with a hook. *Remember to adjust the ribbon to how long or shot you want the picture/mirror to hang. If you have a color scheme in your room feel free to pick a ribbon that would match your room. 3. Then take a command hook and follow the directions given and place the command hook on the wall. Then add the picture frame/mirror and you're all set! Super Cute and Inexpensive decorations! *Remember to always be careful when using a hot glue gun!